Named as the ‘Baby Taj’, this monument is considered the inspiration for the world wonder, Taj Mahal. 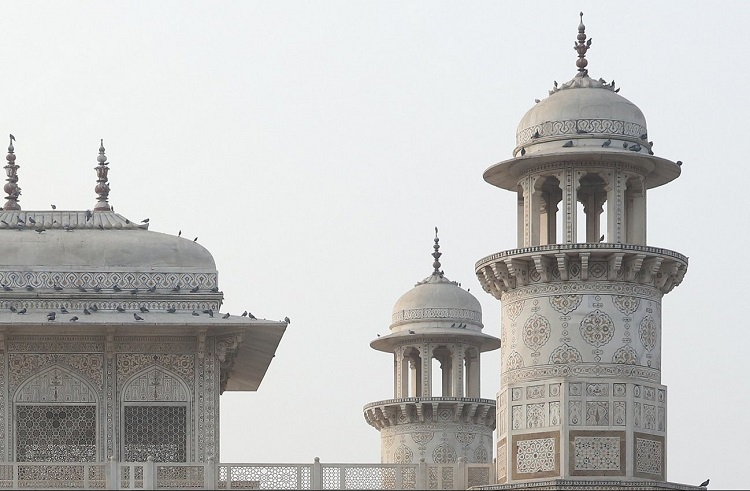 However, the tomb of Itimad-Ud-Daulah is a more delicate artwork with marble lattice screens and fine carvings. This is the first Mughal structure made with marbles by Nur Jahan, mother of Shah Jahan (builder of Taj Mahal). This was the first of many tombs to be erected on the banks of River Yamuna. 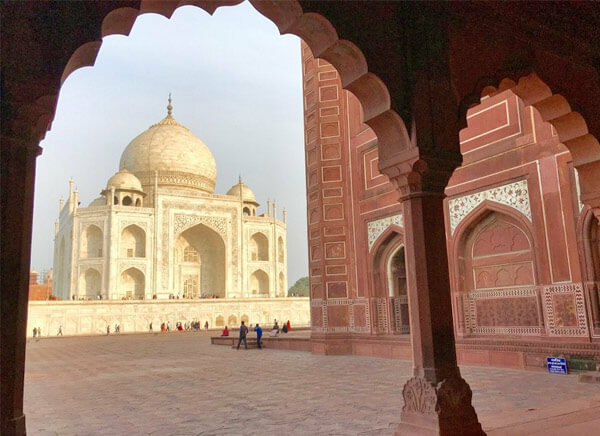 If you are visiting Agra, you ought to pay a visit to this diminishing piece of beauty, which stands as an initial to every marble monument that glorifies Agra. Where is Itimad-Ud-Daulah Tomb Located? 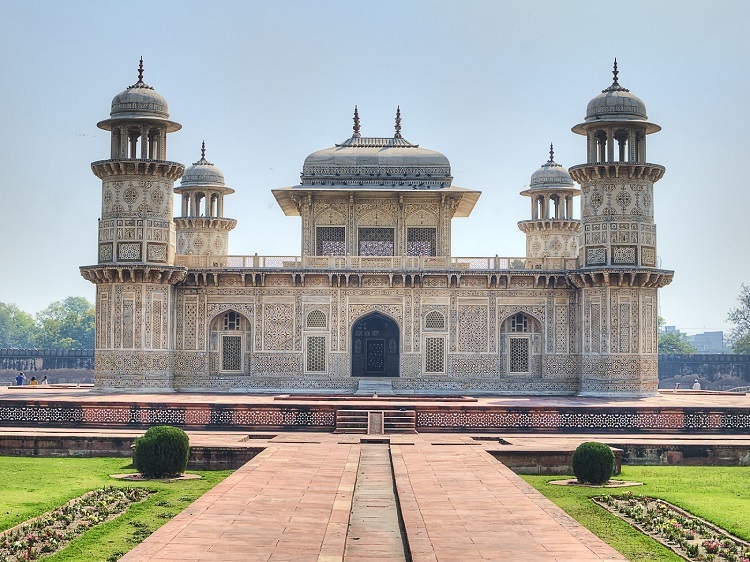 Itimad-Ud-Daulah Tomb is located on the eastern bank of River Yamuna in the city of Agra of Uttar Pradesh. 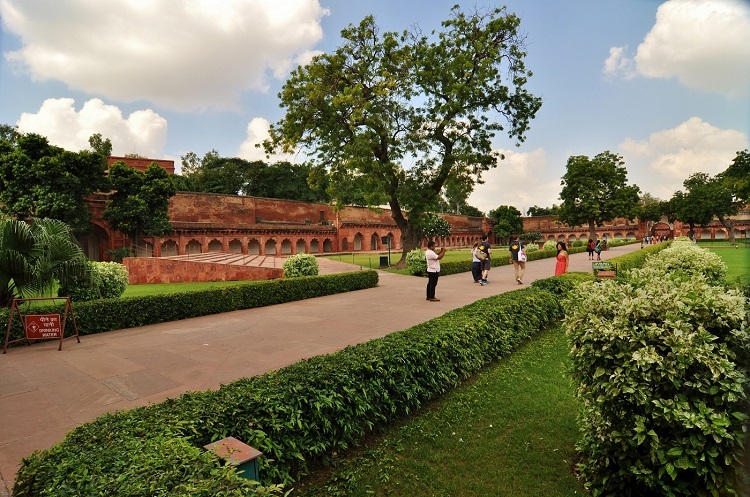 This monument is located in Moti Bagh region of Agra and is 25 minutes away from Taj Mahal and 14 minutes away from Agra Fort. 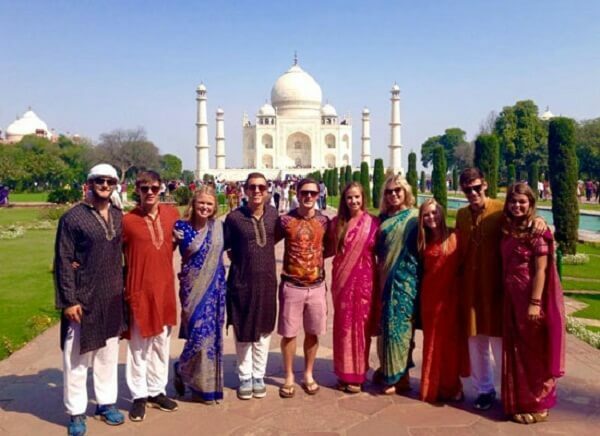 You can find cabs, auto rickshaw and buses from any part of Agra to Itimad-Ud-Daulah tomb. Itimad-Ud-Daulah (Mirza Ghiyas Beg) was a Persian noble. He visited Mughal court and became a court member. He soon became the lord treasurer of Akbar. His daughter Nur Jahan was very passionate and had strong administrative ability. This helped her take responsibilities in the court and gains the attention of Jehangir. Soon, Akbar’s son Jehangir married Nur Jahan. Itimad-Ud-Daulah rose to the power of Chief Minister of Jehangir. 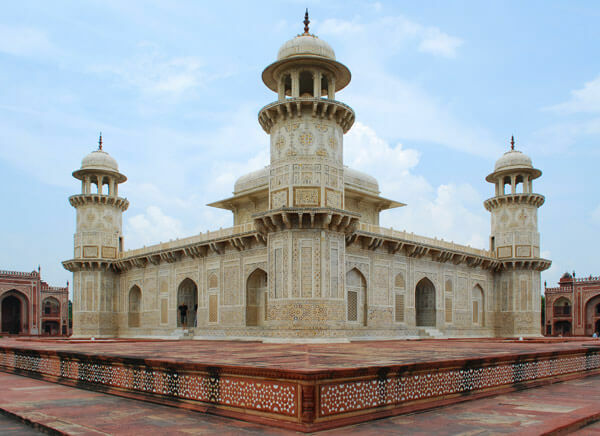 In 1622, Itimad-Ud-Daulah died and his daughter planned to build a marble mausoleum, in the memory of him. The main element of the structure is to resemble a jewel box in the middle of a lush garden. 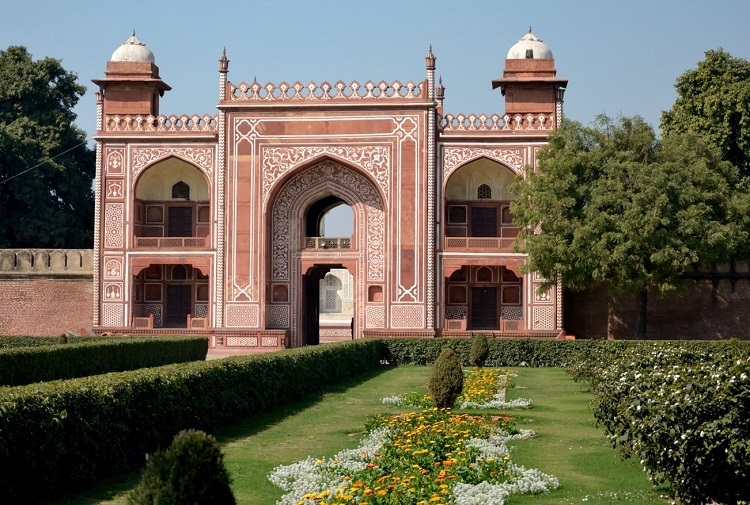 Why is Itimad-Ud-Daulah Tomb Famous? Chine khana decorative scheme is a façade look, which make a vessel or bowl look like it is filled with fruits or flowers. This decoration can be seen in many parts of the gates of Itimad-Ud-Daulah tomb. Marble jali works of Itimad-Ud-Daulah tombare considered more delicate than any other structure of Agra, including Taj Mahal. Influence of Persian architecture on Islamic architectural style can be relished in this monument. The tomb’s architecture is a grand example of the architectural style adopted by many structures in Agra like Taj Mahal and others. The main element of Itimad-Ud-Daulah tomb structure is the dome, which is similar to Persian architecture. This tomb was the first to use pietra dura style decoration with semi-precious stones. Every surface of the structure is decorated with motifs of flora, geometric structure, trees and others. Inlaid stone works are used to enhance the beauty of the interior of the structure. This tomb is tagged as a platform tomb, which is quite a popular style during the reign of Jehangir. This tomb was built just outside the wall of Agra, made with marbles. The mausoleum is placed on a large red sandstone platform, which can be accessed via four monumental gateways. The western gateway is a waterfront pavilion and the eastern one is the main entrance. The southern and northern gateway are false gates, made for the sake of maintaining symmetry. 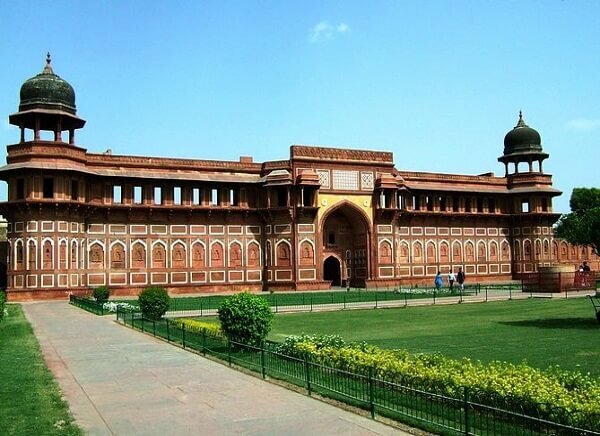 Every gate is made with red sandstone and has geometric designs and chine khana designs made on white marbles. The main tomb is square shaped and has four turrets, which are crowned with small domed kiosks called Chattris. These chattris rise from an octagonal base, one on each corner. The arched entrance of the tomb joins with the center of the mausoleum and is filled with lattice jali works. The inner space of the tomb is geometrically divided into nine chambers. 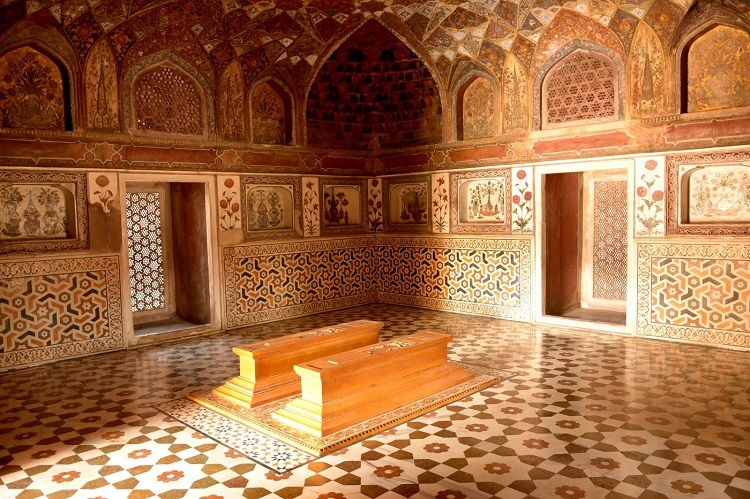 The central chamber is the largest of all and it holds the sarcophagi of Itimad-Ud-Daulah and Asmat Begum. False cenotaphs are placed on the second floor of the monument. The central chamber is accessible only via the southern side. You can find floral designs painted on the walls. Cypress tree decorations can also be found, showing the essence of Persian influence on the structure. The lattice work originated from Gujarat. It was used in Mughal reign intensively for its beauty and for the ability to mutate the natural light to enhance the carvings of the building. Carved panels of calligraphy designs are found on both the levels. The monument is open from dawn to dusk. However, it is recommended to visit during sunset to get a grand view of the monument as it basks the evening sun. 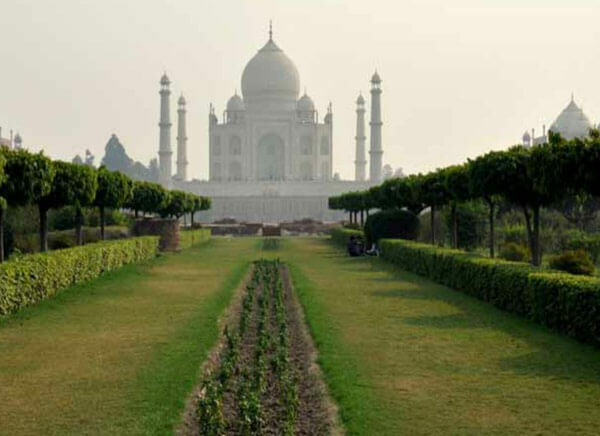 Agra is an in-land region in India. Thus, it has harsh summer and moderate monsoon. March to June is the summer season, which is very harsh, humid and hot. Chances of dehydration is very common during summer and staying outdoors for a longer time during summer is not recommended. It is also not comfortable to stay outdoors and enjoy the monument, when it is showering. Thus, always stick with winter season, which starts in October and ends in February.